Woman injured after dog attack in Letchworth. Historians in Hertfordshire are enlisting help from the public in putting names to faces of soldiers sent off to war in 1914. Hertfordshire Police were called to reports of a stabbing in Letchworth Credit: . A 14-year-old boy has been charged with attempted murder after a teenager was allegedly stabbed in the neck in Hertfordshire. Police were called to Jackman's Place in Letchworth on Friday (June 8) to reports that a 15-year-old boy had been assaulted. He had suffered a cut to his neck and was taken to hospital where he remains in a critical but stable condition. A 14-year-old boy has been charged with attempted murder and possession of a pocket knife in a public place. He has also been charged with attempted grievous bodily harm with intent and possession of a bladed article in a public place. This relates to a separate assault which is alleged to have taken place in Broadway, Letchworth, near to the junction with Station Place, on Friday, June 8 at around 1.50pm. It involved a male victim aged in his 20s. The 14-year-old boy appeared in court today. He has been remanded in custody and is due to appear at St Albans Crown Court on July 13. Police are still appealing for witnesses to contact them on 101. The council which runs local services in Letchworth, Hitchin and Royston has been run by the Conservatives since 1999 but this year saw the Tory majority cut. 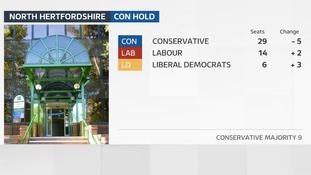 The Conservative lost five seats with two going to Labour and three to the Liberal Democrats. Drivers in Hertfordshire are facing disruption over the coming weeks as work to refurbish two bridges over the A1(M) gets underway. A woman in Letchworth needed medical treatment after she was bitten by a Staffordshire Bull Terrier which had attacked her dog. A 14-year-old girl from Letchworth has been charged in connection with three arsons around the town. An accident is causing delays on the A1M in both directions near Stevenage. There are warnings of queueing traffic on A1(M) both ways in Hertfordshire after a road accident. The incident is between Junction 8 for the A602 / B197 (Stevenage / Hitchin) and Junction 9 for the A505 at Letchworth. Officers are appealing for information after a teenager was assaulted in Letchworth. It happened in the early hours of Saturday morning (October 21) when the victim, an 18 year old woman, was walking past Wyvale Garden Centre, on Hitchin Road and attacked by a man. The victim managed to fight the man off and ran down the road, flagging down a passing car. She didn't suffer any injuries. Wearing a grey turtle neck jumper, ripped wash faded jeans. CCTV cameras have captured the moment woman approached her half-sister's flat disguised as a man, shortly before murdering. Yvonne Caylor was today handed a life sentence for the murder of Nicki Collingbourne, who she attacked with a chicken-shaped ceramic pot on 23 May. Caylor put on a goatee beard, a wig, heavy framed glasses and a hi-vis jacket, before knocking on her sister's door. A woman who disguised herself as a man before murdering her sister with a chicken-shaped ceramic pot has been handed a life sentence.